Advancement Information Session (AIS) – The next AIS webinar is scheduled. 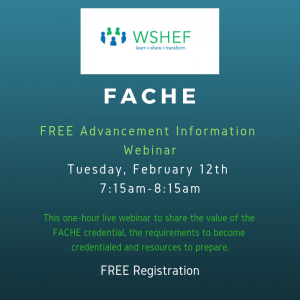 This one-hour live webinar will share the value of the FACHE credential, the requirements to become credentialed and resources to prepare. Why obtain your Fellow in the American College of Healthcare Executives (FACHE)? 1. The FACHE credential demonstrates professionalism, ethical decision making, competence, leadership skills and commitment to lifelong learning. 2. The FACHE credential symbolizes a commitment to excellence; it is a rigorous credential based on multi-faceted criteria—including a valid and reliable examination. 3. Board certification provides the personal satisfaction of achieving a goal and achieving professional recognition. 1. Participate in an Advancement Information Session to learn more about the value of the credential, the requirements to advance, and the resources to make this next move in your professional development. 2. Join a study group to begin preparing for the Board of Governors exam. There may be a group starting in January. 3. Contact the Advancement committee for more information. The ACHE Credentialing website has a wealth of information to show the value of the credential and help you plan your path to attaining board certification as a healthcare executive. Just go to www.ACHE.org/FACHE. And if you cannot attend a WSHEF sponsored Advancement Information Session (AIS) there is a recorded AIS webinar you can view at any time. In addition, all the resources to help you begin your journey are on the ACHE website. And remember, the members of WSHEF are here to help.